Coinciding with my recent purchase of “Xenophanes”, ‘Omar Rodriguez-Lopez’ never ceases to amaze me, with a refined – yet developing – calibre which remains unresolved in certain aspects. It has been some fair-few months since “Xenophanes”, and its awe-inspiring riffs mind-blew everyone within a close radius; still, those beyond its reach have yet to feel the aftershock. At the moment, ‘… Rodriguez-Lopez’ stands on the precipice, as we all hold our breath before the great plunge: I myself – not to mention my partner – have been eagerly awaiting the release of ‘… Rodriguez-Lopez’s’ official third studio-album “Solar Gambling”, and I feel we’ll both have some mixed opinions about its qualities. And off we went. I’ve reiterated time and time again, how the blog itself, and we as its reviewers and maintainers, have constantly developed over the past year. We have shared some interesting opinions through the Joint Reviews, which I find fascinating; and that’s a real understatement – arguments between us can continue on for days, or even weeks at a time, depending on the album, and our opinion of it. Readers of ‘Highly Evolved’ get a nice, round-edged review, replete with constructive criticism [if any], and commendation. Beyond the two-dimensional screen, and the confines of the published blog and internet-viewer-derision, our responses are usually quite blunt, one-sided, and generally lacking in reason. This album threw a wrench into the clockwork for a solid week – we continue to justify our reasons for liking/disliking its construction, its lyrics, its vocalisation, its composition. We are both firm in our opinion of it. Generally, however, albums have been great, and I’m usually open to anything [as is my partner], as long as it refrains from mainstream-pop, R&B, techno or trance. A few months ago, my favourable review of ‘… Rodriguez-Lopez’s’ prior album-release, “Xenophanes“, happened to draw some ‘interesting’ attention from ‘Omar Rodriguez-Lopez Productions” home-site on Twitter. To much surprise, readers seemed satisfied with my five-star rating – of this seemingly side-project-of-an-album [see “Julian Plent Is… Skyscraper” – ‘Julian Plenti’ for further details on my abhorrence of side-projects] – and my positive remarks on its overall-construction, with track after track of psychedelic fantasy and mind-bending electric guitar. I don’t believe it’s necessary to go in-depth about ‘Omar Rodriguez-Lopez’ himself, because I would basically be paraphrasing my previous review of “Xenophanes”; suffice to say, newcomers should take note that ‘… Rodriguez-Lopez’s’ main affiliate band is ‘The Mars Volta’ and “Xenophanes” saw his first vocal-debut together with his girlfriend, ‘Ximena Sarinana’. With that said, I think it’s time I divulge my approach towards evaluating “Solar Gambling” – I’m taking it out of context with my previous opinions of “Xenophanes” [suffice to say, I will be using it as an example, however], because – although my partner will strongly disagree with this – I feel that “Solar Gambling” is a notch below what I expected it to be. It’s not another ‘Jarvis Cocker’ – ladies and gentlemen – but I don’t think it marvels “Xenophanes” by any standard. It’s more appropriate to rate it next to ‘… Rodriguez-Lopez’s’ original debut, “Los Sueños De Un Higado” than “Xenophanes”, because I think I understand what the driving forces were behind “Xenophanes” now, then what I did before. “Los Sueños…“ maintained an elegant-complexity, a fusion of funk, jazz and progressive-rock, that I personally think was wonderfully-exuberant in “Xenophanes”: I’ll use this euphemism again, due to much appeal – it had the Hendrix-happy riffs, and more importantly, dual-vocals, which capped it off and were the icing on the cake, so to speak. “Solar Gambling”, on the whole, drifts between “Xenophanes” and “Los Sueños…“, and lacks the consistency of “Xenophanes”. Take for example, “Xenophanes'” introductory-track “Azoemia”, pure instrumental genius: a recurring sound throughout the album, reappearing often enough to create this repetitive loop so the album never really ended, it continued from finish to start and finish again. “Solar Gambling” seems to take a heavy influence from “Los Sueños…” in that each track remains a stand-alone song – or at least, that’s how I feel it is – whereas “Xenophanes” remained continuous. In this regard, it is not a criticism, but merely a matter of difference. For whatever reason, also, ‘… Rodriguez-Lopez’ is sadly speechless, with ‘… Sarinana’ purely in his place: in this respect, it is why I have drawn similarities between this and “…Los Sueños“, where she is also dominant. 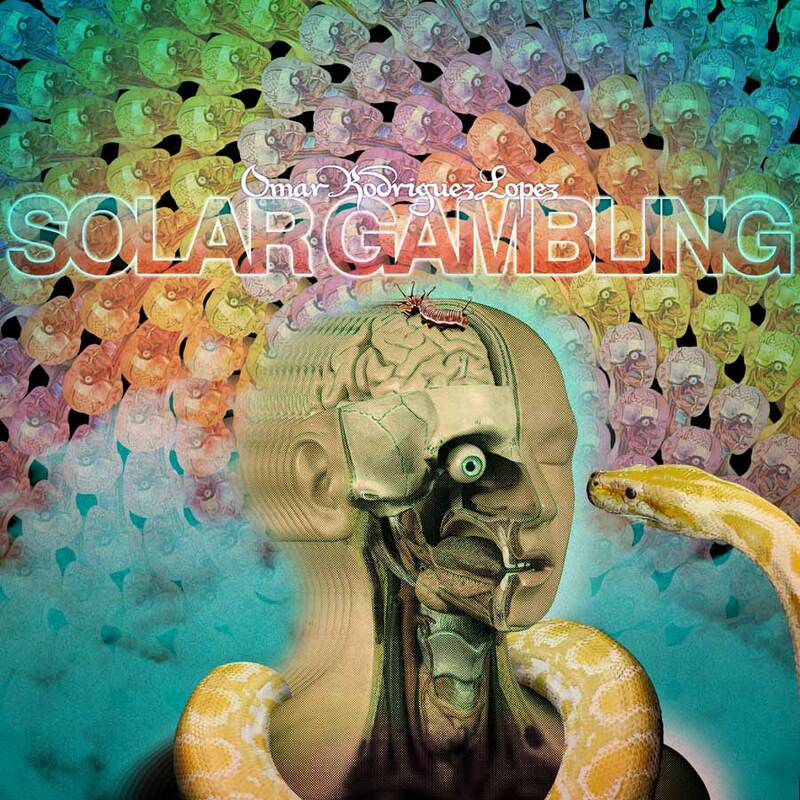 “Solar Gambling”, on the whole, is a nine-piece album with mixed instrumental and lyrical-vocalisation. Topped off at around the 35-minute mark, it is remarkably short in comparison to its counterparts; tracks average around three-minutes, there are only a handful of fives, mostly twos and threes. Progressive-rock influences are less obvious, although not entirely hidden and its riffs seem distracted with reinforcing vocals or maintaining rhythm instead of leading, or taking a solo. The album has a massive musical shift half-way through, and breaks away from ‘…Volta’ influenced guitar and composition, to progressive-rock-ambience reminiscent of ‘Sigur Ros’. Listeners will notice the predominant use of piano with its arrival, at around “Poincaré“, and following with the smoky, distant haze of “Los Tent áculos De La Libélula”. Instead of lead, we have this multi-layering of string and percussion, or percussion, or synth, and a quickly-fading ‘… Sarinana’. Again, on the whole, very different from “Xenophanes“. It is a matter of opinion whether this difference is necessary, positive, or in fact negative – but ‘Omar Rodriguez-Lopez’ remains a compositional genius. This album, I believe, represents a willingness to break away from the expected and embrace the unexpected; he is putting out feelers in all directions – tasting the air if you wish – for the best possible quality of music. “Solar Gambling” is a mixed half-breed of ‘… Volta’ influences, ‘Sigur Ros’, “Bladerunner”-reminiscent ‘Vangelis’ and of course, ‘Omar Rodriguez-Lopez’ himself. In this respect, I admire the album, but it doesn’t fully agree with me, and in some aspects, the spark burns a little less brighter in some than in others. “Locomocion Capilar” is “Solar Gambling’s” opening track, and it’s probably the last “Xenophanes”-sound-alike you’ll here for the rest of the album. It has the classic progressive-rock guitar, and it brings back the best that ‘… Rodriguez-Lopez” has to offer; I suppose I’m just missing ‘Omar’s…’ vocals, that’s all. Again, you already know what to expect, a mix of guitar, percussion, synth, and of course, ‘… Sarinana’. At 3:23, it’s unusually short. “Las Flores Con Limón“ brings into focus the general intimacy of the album, between listener and “… Sarinana”, and its opening serenade between guitar and ‘… Sarinana’ is very elegant and withdrawn. The track bounces between explosive outbursts of progressive-rock and intimacy, demonstrating the elements to come. I’ll skip straight to “Poincaré“, because I think it’s one of the strongest tracks on the album. It breaks away from that progressive-rut that the album initially clings to, and involves only ‘… Sarinana’ and a piano throughout the track. With some added distortion between the audio left/right channels, some wavy synth, and far-away echoes, it is hauntingly beautiful. Because of this focus, it is an unexpected delight – however short-lived it might be. “Los Tentáculos De La Libélula” follows, and it’s not at all what I would expect from “Solar Gambling”, or ‘… Rodriguez-Lopez’ himself. It is very dark, very despondent, and being an instrumental, somewhat intimate also. Another poignant track, sadly ephemeral, it is where I’ve made my connections to “Bladerunner” – it’s easy to imagine Rick Deckard flying towards Tyrell Corp; maybe I’m just being overly imaginative today? ~ by enantiomorphicgod on December 22, 2009. Thank you for posting this. Always searching for new talented artists. No problems – my pleasure!